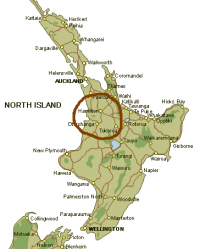 The Waikato region is in the north-central part of the North Island of New Zealand. The name is taken from the Waikato River, which is New Zealand’s longest river and flows throughout the region; waikato is a Maori word traditionally translated as “flowing water” – specifically, “wai” = “water” and “kato” = “the pull of the river current in the sea”. The Waikato River flows through the centre of Hamilton, the only city in the region. The central Waikato basin includes some of the most productive land in the country. The broad floodplain of the Waikato River is largely pastoral farmland created by draining the extensive natural swamps. The Waikato region now has 30% of New Zealand’s wetlands. It’s estimated that 90% of the Waikato wetlands has been drained in the last 150 years, and this is ongoing. The Waikato region is mainly famous for its hugely productive dairy farms. But this is so much more than the land of milk and honey. There are local producers growing a wide variety of crops for local and global markets. There are also many keen gardeners producing food in their backyards and on lifestyle blocks. 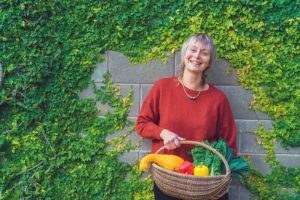 My friend and neighbour Clare Jackson, of GreenFootprint, who teaches food gardening, says you can grow just about anything here. It’s a very fertile place. The Waikato has been regarded as a foodbasket, flourishing with food, since the first Maori settlers arrived more than seven hundred years ago. The Tainui waka (canoe) landed at Kawhia harbour in the thirteenth century. Succeeding generations of Tainui descendants made their way inland, colonising the rich river valleys of Waipa and Waikato. The people of Tainui enjoyed an abundant coastal fishery, including the gathering of shellfish. They hunted birds in season in the forests that covered the land. Much of the inland Waikato region was wetlands, a network of vast peat swamps and waterways, with low-lying ridges and areas of higher ground between. These lakes and wetlands teemed with eels and many other kinds of fish: piharau (lamprey), upokororo (grayling), kokopu, inanga, waikaka (spring eels, mudfish), and papanoko (torrent fish) were all an important part of the traditional Maori diet. Maori were also gardeners, cultivating crops they had brought with them such as kumara, taro and hue (gourds), and harvesting indigenous resources like ti kouka (edible cabbage tree – cordyline species). From the 1830s they quickly embraced European-style agriculture, clearing and planting vast areas in wheat, corn, oats and barley. Two decades on, Waipa had established itself as the granary of the Auckland Province, Maori transporting their milled flour and surplus produce downriver to the burgeoning Auckland market, and even further afield to Australia. Their expanding agricultural endeavours included potatoes, cabbages, onions, carrots, turnips, marrows, beans, watermelon; and fruit such as apples, peaches, quinces, cherries and grapes. Dairy cows were also kept. Although the Treaty of Waitangi in 1840 had guaranteed to Maori the full, exclusive and undisturbed possession of their lands and fisheries and other resources, in fact they faced relentless pressure to sell their lands. Growing Maori aspirations for a place in the new colonial order, coupled with mounting concern over land alienation, saw the advent of the Kingitanga, a pan-tribal political movement to unify and strengthen Maoridom. Potatau Te Wherowhero was crowned the first Maori king at Rangiaowhia in 1858. The threat the Kingitanga posed to British colonisation became the pretext for the military invasion of the Waikato, in July 1863. More than a million acres of land was confiscated, including the coveted foodbasket of Waipa. Waikato’s former landowners were displaced, many seeking sanctuary with relations in the King Country to the south. The military settlements of Hamilton, Cambridge, Te Awamutu, Kihikihi and Pirongia were established to guard the frontier, the newly-won lands balloted to “military settlers” to make them stay. A 1927 government inquiry, the Sim Commission, declared the confiscations of Waikato lands unjust. In 1995 the Crown formally apologized and financial compensation was made, through the Waitangi Raupatu Claims Settlement Act 1995, which recognized the legal and moral injustice of the 1860s confiscation. The first European settlers in the Waikato found it was much harder than they expected to make a living from the land. In the 1870s many of the original pioneers abandoned their military allotments or sold out to property speculators. The development of refrigerated shipping from 1882 meant butter and cheese could be exported to the UK. But it took extensive swamp drainage schemes, scientific advances in soil and pasture management and herd improvement, the building of transport routes, and many years of back-breaking labour, before the Waikato became New Zealand’s foremost dairy-farming area. Despite its international reputation for dairy farming, there have always been other animals farmed in the region, including beef, sheep, pigs, goats and deer. Horticultural crops of the Waikato include asparagus, onions, blueberries, potatoes and melons, nectarines, peaches, apples, pears and blueberries. There are also vineyards, particularly at Te Kauwhata. In the 1980s economic deregulation, agricultural subsidies were removed. This meant that sheep and beef farms were less profitable, and dairy farming became more intensive, with not just larger farms, but bigger cows producing more milk, heavier stocking, and year-round milk production. This in turn resulted in increased pollution of the waterways and ultimately the Waikato River. 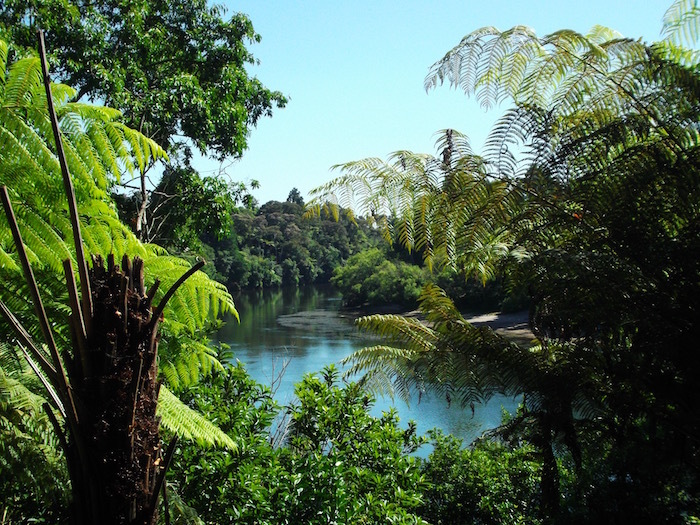 The Waikato River Authority was established in 2010 with a mandate to improve the health of the Waikato River. Thanks to historian Jane Luiten for her generous assistance with this article. The history section is largely based on her research (see sources). Also thanks to researcher Anna Cox for her helpful comments and discussion. Barber, L.H., The View from Pirongia: The History of Waipa County, (Te Awamutu, Richards Publishing & Waipa County Council, 1978). Jones, Pei T.H. & Bruce Biggs, Nga Iwi o Tainui: The traditional history of the Tainui people: Nga korero tuku iho a nga tupuna, (Auckland, Auckland University Press, 2005 reprint). King, Michael, The Penguin History of New Zealand, (Auckland, Penguin, 2003).